There may be no better saltwater fish to take on the fly than the tarpon. Yucatan baby tarpon are no different. Hard fighting, high jumping and beauty make this gamefish the holy grail of saltwater fly fishing. However, targeting tarpon on the fly might seem a little intimidating to some. The thought of making a 60-foot cast in a 15-knot wind and presenting a fly to a fish pushing 100 pounds keeps some anglers from venturing onto the flats. Anyone looking to tangle with a tarpon on the fly should first get their chops down by targeting baby tarpon. There is no better year-round fly fishing destination for baby tarpon than the Yucatan Peninsula. My first experience with Yucatan baby tarpon was the in the Campeche area. The city of Campeche is a wonderful colonial community nestled along the mangrove-lined coast six hours west of Cancun. The city has spectacular views of the ocean, and the town square is highlighted by an amazing cathedral that towers over the city. The fishing is just as spectacular! Within a short panga ride from your hotel, you can cast flies to rolling tarpon on the open-water flats. Tarpon here are accommodating, often hitting poppers or a well-placed subsurface fly. Once hooked, baby tarpon put on a spectacular show, burning fly line off reels and making their trademark jumps. East of Campeche and 3.5 hours from Cancun is the small fishing village of San Felipe. This area is a primary tarpon nursery. Miles of mangrove-lined coast provide a safe haven, allowing tarpon to grow up to 40 pounds. Anglers make casts to large schools of rolling tarpon over shallow eel grass flats early in the morning and late in the afternoon. The town of San Felipe is quaint and offers some of the best local seafood in the Yucatan. The tackle set up for Yucatan baby tarpon is simple. I carry two rigs. The workhorse is a 9-foot, 8-weight rod matched with a large arbor reel that can hold 200 yards of 20- or 30-pound backing. I fish a saltwater taper floating line. The second set up is a 9-foot, 9-weight rod and reel matched with a 30-foot intermediate sink tip and a shorter leader of 7 to 9 feet. This outfit works great subsurface. 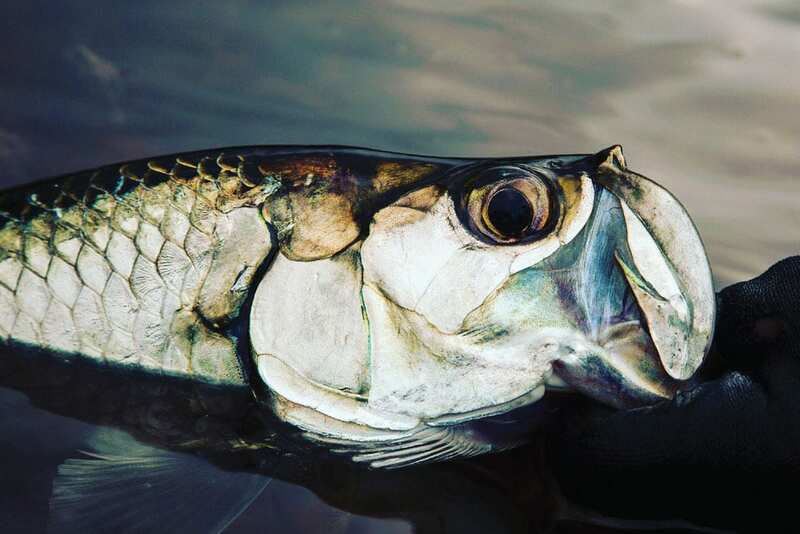 Baby tarpon can be spooky, so keeping the fly line out of the tarpon’s field of vision, especially in calm conditions. I suggest a 10- to 12-foot leader of 20-pound test with a floating line. You’ll also need a short 40-pound bite tippet. My favorite flies for baby tarpon are size 2 Gurglers and Toad patterns. Both these flies will cover any situation you may encounter. My go-to colors are red/black, chartreuse/white and purple/black. If you’re looking for that first-time tarpon destination and want lots of great sight fishing action, book your trip to the Yucatan peninsula ASAP!